As soon as you enter a casino, regardless of whether it’s online or land-based, you may find yourself overwhelmed by the sheer number of slot machines that are available. Well, Slots of Vegas is here to teach you a thing or two about online video slots – at least enough so that you don’t look like a dope trying to navigate your way through all the casino games. Starting with the basics, there are really only two categories of slots: classic 3 reel slots and video slots. Reel slots are pretty self-explanatory, having physical reels that spin around. These are the ones you’ll find in a land-based casino with 7s and red cherries painted onto three reels. Video slots are also self-explanatory, as they use the same internal mechanism but depict the “spinning slots” on a computer screen, with animated video graphics. If you’ve ever come across any slot on the internet, it was a video slot game. It doesn’t matter whether you are pressing a button on a physical machine with the hope of coins spewing out or clicking your computer’s mouse with the hope of endless electronic riches – the game will look and operate exactly the same. How does video slot machine work? Slot machines don’t rely on weights and pulleys to spin like the old-fashioned machines used to. Instead, they operate on something called a random number generator, or RNG. The whole system is pretty simple – it’s a computer program that uses an algorithm to constantly produce numbers. When you click the “Spin” button, a number sequence that corresponds to spots on the wheels is recorded. These numbers determine which symbols you’ll get and the slot depicts spinning reels that will eventually land on these spots. Without RNG technology, online casino games wouldn’t be possible, meaning you would actually have to put on pants before heading over to a brick-and-mortar casino and taking a spin on the slots. So, take a moment and appreciate it! RNGs are often tested and certified for fairness, meaning that you know you’re not being gypped by a rigged machine. With RNGs, each spin is a completely independent event, separate from all previous and future spins. If lady luck is on your side you could potentially win the jackpot! Because video slots are shown on high-quality display screens rather than physically spinning reels, they contain a lot of unique features that couldn’t exist for more traditional slot machines. If you’ve ever played a video slot then you’re probably familiar with these unique features, such as scatters, wilds, and surprise pieces. For a quick reminder, a scatter is a piece that you want a lot of. When 2 or 3 scatters appear on the screen, you receive payouts, regardless of where on the screen they land. Another symbol that you will only find in video slots is the wild or substitute piece, which can substitute for any symbol (other than a scatter) to help complete a winning combination. Without an advanced operational system, the slot machine would have no way of recognizing a given symbol as being a functional replacement for all other pieces. Yet another piece that would only be feasible with a video slot game is the surprise piece. On some slots, this piece flickers back and forth through a few of the games’ symbols. Only when the reels stop spinning does the surprise piece settle on a single symbol. This adds an extra factor of suspense and can turn the video slot into even more of a real game of thrills! One reason people prefer video slots to their classic counterpart is the available features. 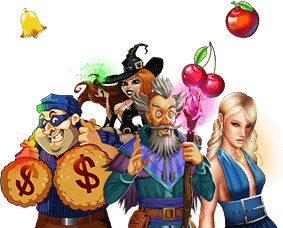 This can come in the form of free spins, double earnings per spin, or a myriad of other bonuses. Just know any feature will mean more winnings for you. Usually when these features are triggered, symbols become animated and, depending on the slot you’re playing, a short video will play narrating the theme and what kind of bonus you’re about to activate. Some 3D slots will have the highest-quality graphics and interactive components. If you don’t pay attention too closely, you may think that you’re playing a video game instead of a round of slots! One of the biggest differences between more traditional reel slots and video slots is how you bet. When playing reel slots, you bet coins with a set value, but with video slots you have the flexibility of setting the denomination and then choosing how many of that amount you want to bet. Depending on which slot you choose, this could mean how many “coins” in the traditional sense, or it could refer to how many paylines you are betting on. With 5-reel video slots, there are often 20 or more paylines per game. You can choose to bet less money on more paylines – sometimes even as little as one penny – or, if it strikes your fancy, you could bet higher stakes on fewer paylines. By clicking on the options tab, you can adjust the denomination according to your preferences. You may have heard the advice, “Bet Max, always Bet Max” before, but it isn’t always the best choice. On more traditional 3-reel slots, you have to bet the maximum number of possible coins in order to be eligible for the jackpot. With these slots, there are a limited number of paylines and the denominations are limited, so it makes sense. But with video slots, there are often 5 or more reels, with a lot of paylines and a huge possible denominational increase. So, it makes sense that the incentive to bet max on video slots is low and the cost potentially massive – not to mention that the payouts aren’t better or worse depending on how many “coins” you bet. If you want to make the most of your bankroll, then the best option is to shop around and look for the slot game with the best payout rate. A given machine won’t reward you for a higher or lower bet, but higher denomination machines will often offer higher payouts and better odds than those previously mentioned penny and nickel machines. Other than finding a machine with good payouts, the next best thing you can do to win it big on video slots is to get used to the game. Video slots offers you the option of adjusting speed, so you can take the time to understand what is happening with the spinning reels without getting overwhelmed. If you know you’re prone to getting distracted, then adjust the volume. After all, it may be harder to get away with gambling online while you’re sitting in a quiet library or a calm coffee shop. Under the options tab, you can lower the volume and avoid the judging stares. If you know you want to play successive rounds, set up your autospin or autoplay feature. You can choose how many rounds, and whether or not you want to pause between rounds when you trigger features and win big rewards. The best way to get comfortable with a video slot is by playing in practice mode. You can get your bearings without having to worry about risking your bankroll. Once you’ve mastered the controls and know what all the symbols do, you’ll be a video slot-winning champ! Not all online casinos offer practice mode, though, so you have to do some research and find which one suits you best. Slots of Vegas has a practice mode, so you can try out and learn the ropes to over 100 slot games before putting money on the line. Head on over to Slots of Vegas and start spinning those virtual video slot reels today!